In this article we will go over how an inverted strut design works and the benefits of the design versus a standard upright strut. There are two different types of damper (aka shock) designs within MacPherson strut suspensions (Figure A). There is an upright design (Figure B) and an inverted design (Figure C). The damper essentially acts like one of the control arms in the suspension system. In addition to vertical loads over bumps, the damper also sees bending loads from cornering. You want the damper to be as rigid as possible in bending for many reasons, but most importantly it provides better steering feel, ensures camber settings stay in spec under load, and greater longevity of the internal damper components. An upright strut takes the bending load on the actual piston shaft itself. The piston shaft is supported by the upper guide bushing (green) and the piston (purple). The piston shaft is typically anywhere from .5" to .75" in diameter depending on the damper brand. This is not ideal for taking bending loads. An inverted strut takes the bending load on the outside of the damper body. The damper body is supported by two guide bushings (yellow) in an outer tube whose sole purpose is to support bending loads. 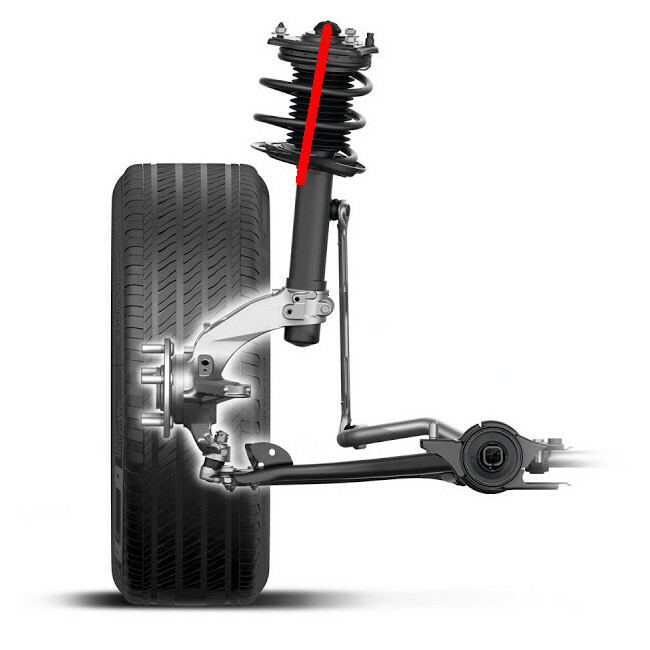 A typical inverted struts body is about 1.75" in diameter. This makes for a MUCH stiffer design in bending. Why are OEM dampers upright if inverted is better? In a nutshell, they are cheaper to produce. One way to combat the bending load on the damper is with the spring. Have you ever noticed how the spring sits at an angle on your OEM strut? The force generated by the angled spring helps counter the bending loads placed on the damper during cornering and this is what helps an upright design work in a MacPherson strut. When we "upgrade" to performance oriented suspension kits with adjustable height springs (coil overs) we loose the aid of an angled spring. Because the outer body of an inverted damper is taking the bending load, this means the piston shaft nor the piston itself have any side loading like an upright damper. This means the piston shaft guide bushing (green) lasts much longer before it needs replacing. The piston shaft also has seals that keep the pressurized oil from escaping the damper. The same applies to the seals, since there are no side loads from the piston shaft, the seals last much longer than an upright damper. The seals are also protected by the outer support tube which virtually eliminates the possibility of debris contamination. On an upright damper, one way to increase bending rigidity is to increase the diameter of the piston shaft. Unfortunately, the larger the piston shaft, the less room there is for oil in the damper housing (white). Additionally, the larger the piston shaft displaces more fluid when compressed which in turn compresses the high pressure gas even more. In the diagram you will see where blue = uncompressed and Red = compressed too much. This increase in gas pressure results in extra unwanted forces and friction. Ideally you only want the gas pressure to be high enough to keep the fluid from cavitating and that is it. Since the piston shaft of an inverted strut sees no side loading, the piston shaft can be very small in diameter. This in turn allows for more fluid in the damper and prevents the gas pressure from becoming a factor at any point in the suspension travel. In the diagram you will see the where blue in both scenarios has a large enough volume to prevent high gas pressure.